Security and Maintenance in Windows 10, reporting Storage Space issue in Maintenance section. Windows Security Center in Windows XP Service Pack 2 reporting no antivirus product is installed. Security and Maintenance (formerly known as Action Center, and Security Center in earlier versions) is a component of the Windows NT family of operating systems that monitors the security and maintenance status of the computer. Its monitoring criteria includes optimal operation of antivirus software, personal firewall, as well as the working status of Backup and Restore, Network Access Protection (NAP), User Account Control (UAC), Windows Error Reporting (WER), and Windows Update. It notifies the user of any problem with the monitored criteria, such as when an antivirus program is not up-to-date or is offline. Security and Maintenance consists of three major components: A control panel applet, a Windows service and an application programming interface (API) provided by Windows Management Instrumentation (WMI). The control panel applet divides the monitored criteria into categories and color-codes them. Yellow indicates a non-critical warning, e.g. some settings are not being monitored or are not optimal. Red indicates a critical message, e.g. anti-virus program is offline. A service, named "Security Center", determines the current state of the settings. The service, by default, starts when the computer starts; it continually monitors the system for changes, and notifies the user if it detects a problem. In versions of Windows prior to Windows 10, it adds a notification icon into the Windows Taskbar. A WMI provider makes the settings available to the system. Third-party anti-virus, anti-spyware and personal firewall software vendors primarily register with Security and Maintenance through the WMI provider. Windows Vista added a new set of APIs that let programs retrieve the aggregate health status within Security and Maintenance, and to receive notifications when the health status changes. These APIs allow programs to confirm that the system is in a healthy state before engaging in certain actions. For example, a computer game can ensure that a firewall is running before connecting to an online game. Managing problems logged by Windows Error Reporting: The user can see their details, send them to Microsoft if they are not automatically sent, query a solution for them (although most of the times, there is none) or selectively delete them. Microsoft learned from discussions with customers that there was confusion as to whether users were taking appropriate steps to protect their systems, or if the steps they were taking were effective. From this research, Microsoft made the decision to include a visible control panel with Windows XP Service Pack 2 that would provide a consolidated view of the most important security features. Service Pack 2, released in August 2004, includes the first version of Windows Security Center (WSC). This version monitors Windows Update, Windows Firewall, and the availability of an anti-virus program. Third-party providers of personal firewall and anti-virus software packages were encouraged to use WSC API to register their products with WSC. On 25 August 2004, PC Magazine published an article in their Security Watch newsletter titled "Windows XP SP2 Security Center Spoofing Threat" which outlined a design vulnerability which could allow malware to manipulate Security Center into displaying a false security status regardless of the true security status. To do so, the malware requires administrative privileges. Microsoft countered their claim by asserting that if a piece of malware gains administrative privileges, it need not spoof anything, as it can commit much nastier malicious actions. WSC in Windows Vista monitors new criteria, such as anti-spyware software, User Account Control, and Internet Explorer security settings. It can also display logos of third-party products that have been registered with the Security Center. Unlike Windows XP, in the beta versions of Windows Vista, WSC could not be disabled or overridden. Security software maker Symantec spoke out against this, noting that it would cause a great deal of consumer confusion because any security problems would be reported by both WSC and Symantec's tools at the same time. McAfee, another large security software vendor, lodged similar complaints. In the end, Microsoft allowed WSC to be disabled. In Windows 7, Windows Security Center has been renamed Action Center. It was designed to centralize and reduce the number of notifications about the system; as such, it encompasses both security and maintenance of the computer. Its notification icon on Windows Taskbar only appears when there is a message for perusal and replaces five separate notification icons found in Windows Vista. A "Troubleshooting" link was also added, providing a shortcut to Windows 7's new Troubleshooting control panel. In Windows 8, Action Center monitors 10 new items: Microsoft account, Windows activation, SmartScreen, automatic maintenance, drive status, device software, startup apps, HomeGroup, File History, and Storage Spaces. "Windows Defender Security Center" redirects here. For the anti-malware component of Microsoft Windows, see Windows Defender. Windows Defender Security Center in light mode on Windows 10 Creators Update. In Windows 10, the name "Action Center" is now used for application notifications and quick actions. The Action Center from Windows 8.1 was renamed to Security and Maintenance, causing confusion for users and IT administrators. It no longer displays an icon in the notification area, but otherwise retains all the features of the Windows 8.1 Action Center. The "Troubleshooting" link was removed in Windows 10 Fall Creators Update. Starting with Windows 10 Creators Update, Microsoft has introduced a new component called Windows Defender Security Center (WDSC) that provides much of the same functionality. This new component is a Universal Windows Platform app and is also the default front-end for Windows Defender. It relies on its own service, called "Windows Defender Security Center Service". Does not regard other personal firewall: In Windows 10 version 1703, if Windows Firewall is disabled, it raises a false alarm, claiming the system is not protected. In Windows 10 version 1709, the false alarm is not raised but WDSC does not provide meaningful monitoring of third-party firewalls the way Security and Maintenance does. 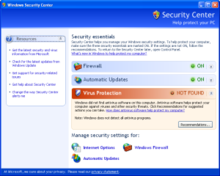 ^ "Microsoft Windows Security Center: The Voice of Security for Windows Vista". Microsoft. 6 October 2006. Archived from the original on 4 November 2015. Retrieved 16 November 2009. ^ Munro, Jay (25 August 2004). "Windows XP SP2 Security Center Spoofing Threat". PC Magazine. Ziff Davis. ^ Jeremy Reimer (2006-09-27). "Symantec says Vista will "reduce consumer choice"". Ars Technica. Retrieved 2006-10-14. ^ Hines, Matt (2006-10-03). "McAfee Chides Microsoft Over Vista Security Policies". eWeek. ^ Seltzer, Larry (2006-10-16). "Microsoft Caves on Vista Security". eWeek. Retrieved 2008-08-13. ^ Gilmour, Sean (11 November 2008). Sinofsky, Steven (ed.). "Action Center". Engineering Windows 7. Microsoft. Retrieved 29 October 2014. ^ Rubenking, Neil J. (20 November 2008). "Security in Windows 7: Getting Started". PC Magazine. Ziff Davis. ^ Shultz, Greg (2 August 2012). "Keep tabs on performance in Windows 8 with Action Center". TechRepublic. CBS Interactive. Retrieved 29 October 2014. ^ "Where is Action Center in Windows 10?". Microsoft. ^ Chen, Raymond (16 May 2017). "There's a group policy for Action Center, and another one for Action Center". The Old New Thing. Microsoft. ^ a b Lich, Brian (18 May 2017). "Windows Defender Antivirus in the Windows Defender Security Center app". docs.microsoft.com. Microsoft. ^ Popa, Bogdan (24 August 2017). "Quick Tip: Use the Old Windows Defender in Windows 10 Creators Update". Softpedia. SoftNews. ^ a b Lich, Brian (17 Oct 2017). "The Windows Defender Security Center app". docs.microsoft.com. Microsoft. In Windows 10, version 1709, we increased the scope of the app to also show information from third-party antivirus and firewall apps. This page was last edited on 18 March 2019, at 23:33 (UTC).